Do you even need a full-time office anymore? 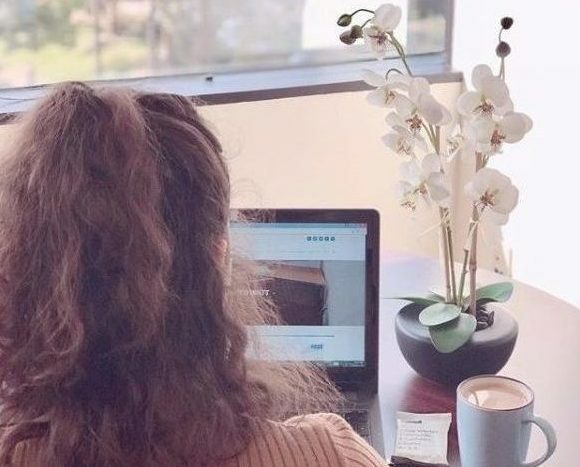 A growing number of startup founders, independent professionals, remote workers and freelancers work from wherever they can set up a laptop, including coworking spaces and shared workplaces. If you fall into one of these categories, however, you may need occasional access to meeting rooms, conference rooms, digital mail services, a place to meet clients, professional business amenities, or a virtual office. The number of shared workspaces increases every year, and many offer virtual offices. So, locating a space near you shouldn’t be a problem. But not all virtual office offerings are the same. You’ll want to find a professional space that suits your brand and preferences, so tour a few spaces, if possible, before you choose one. You also want to get the best price possible on your membership package. Here are eight ways to negotiate the best deal for a virtual office, while making sure you end up in the best space for you and your business. 1. Talk to the workspace provider directly. Emails, and even phone calls, are never as effective as an in-person conversation. This also give you a chance to check out the space and see if it’s a good fit for you. 2. Ask for a multi-month discount. Most shared workspace operate on month-to-month membership commitments. You may be able to negotiate a better price if you commit to three, six or 12 months in the space. For instance, Pacific Workplaces offer two months free when members make a 12-month commitment. 3. Ask the space operator to waive the service deposit. If your workspace requires a service deposit, ask about waiving it in exchange for paying by credit card or for several months upfront. 4. Do your research. When you tour a workspace, bring in quotes from other service providers offering the same, or similar, plans. The space operator may be willing to meet or beat a competitor’s price. 5. Get things notarized in-house. If you’ll receive mail at your new workspace, you’ll likely need to to submit a Certified Mail Receiving Agent (CMRA) 1583 Form from the U.S. Postal Service. 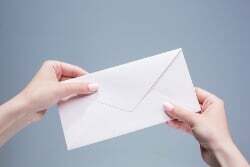 This form authorizes the workspace provider to receive mail on your behalf. Ask about getting the form notarized in-house to save some money. 6. Ask about minimum requirements for booking meeting rooms and virtual offices. There’s no need to pay for extra time you don’t need. Pacific Workplaces has a one- hour minimum booking requirement, while other providers may force you to book in blocks of four or even eight hours at a time. 7. Keep add-on costs low. Does the workspace have add-on or incidental costs for services such as notifying you of mail or packages received, or scanning and copying? Ask about these costs up-front, as they will add to the base membership rate. 8. Ask about service bundles. If you bundle your virtual office with mail receiving, live phone answering, a digital mailbox service where you receive scans of your mail received, meeting room rental or other services, you may get additional discounts. You should also be able to customize your membership to meet your needs. 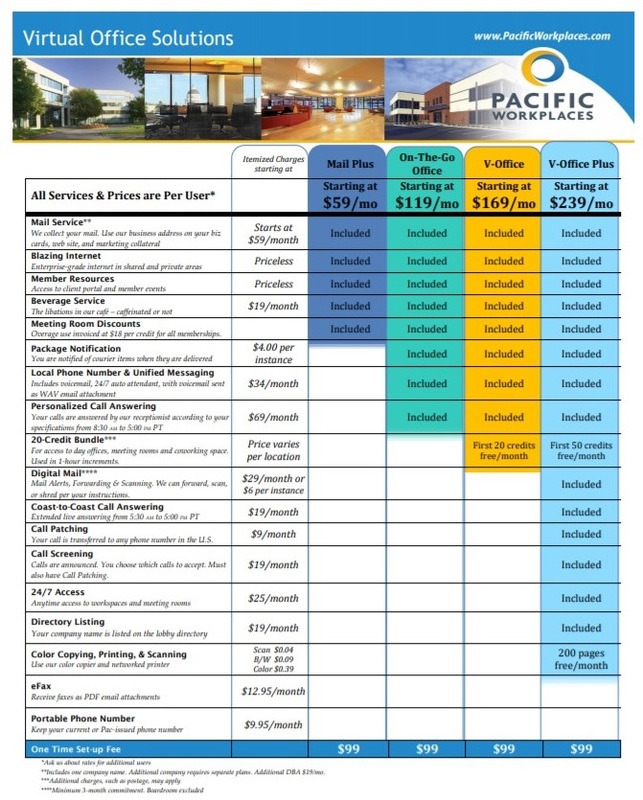 For instance, Pacific Workplaces and CloudVO offer bundled plans that are inherently discounted. You can add-on products to any plan, or choose one of the most all-inclusive plans that already include most services such as their top-tier VOffice Plus plan. 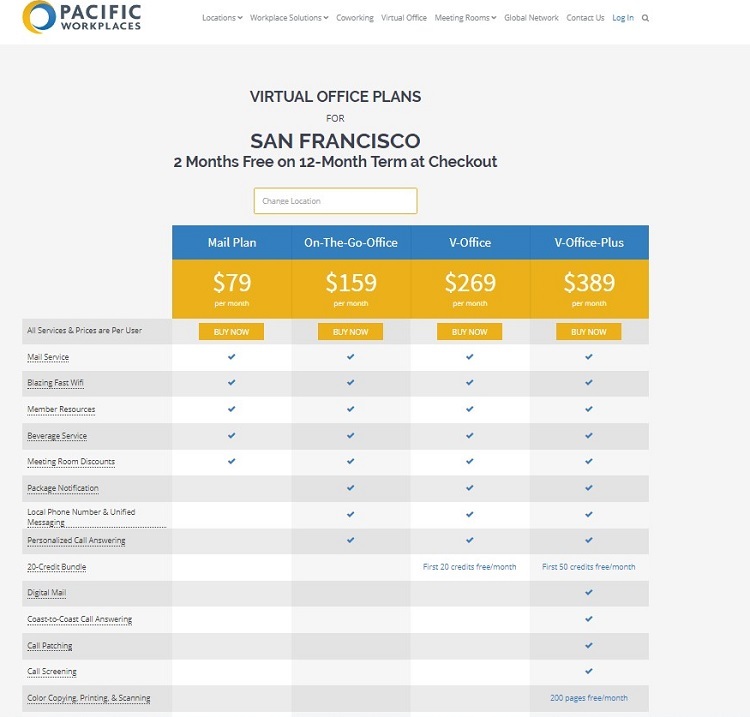 Users can download a complete Virtual Office Pricing Sheet from the Pacific Workplaces website which outlines all services included with each plan as well as an itemized price list of add-on services for those who want to create a customized solution for their business. Pricing transparency is important. Ask your provider for a price list of everything included in your Virtual Plan, including a clear understanding of additional costs for add-on services. Takeaways: If you only need occasional access to workspace, or a professional business address, a virtual office membership is a great way to go. When shopping around different spaces, remember to do your research about competitor pricing and offerings, and negotiate for the best deal, whatever your workspace needs may be. 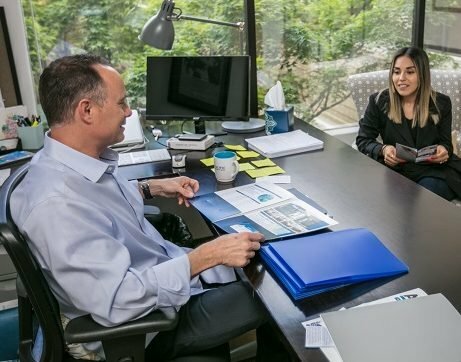 Pacific Workplaces has 17 shared workspaces across California—including coworking in Santa Cruz, Oakland, and the greater Bay Area, meeting rooms in Silicon Valley and San Francisco, offices in Sacramento, virtual mail in San Jose and Berkeley, and virtual offices—that suit a variety of needs and workstyles. Find a location near you.